"This is a great way to use up grilled chicken leftovers. Serve on a bed of greens." Lightly oil grate. Grill chicken 10 minutes on each side, or until juices run clear. Remove from heat, cool, and cube. 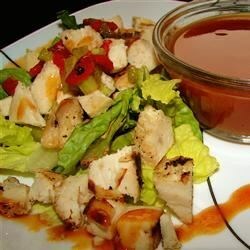 In a large bowl, toss together the chicken, celery, red bell pepper, onion, and corn. In a small bowl, mix together the barbeque sauce and mayonnaise. Pour over the chicken and veggies. Stir, and chill until ready to serve. This was an excellent recipe! I added 1/4 cup walnuts and 1/4 cup raisins. It tasted great! Thanks for a wonderful recipe! Really good and easy to make. Good for showers and get togethers because you don't have to keep it warm.